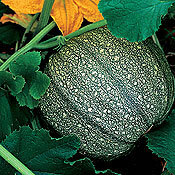 description for "Winter Squash and Pumpkins: Cucurbita pepo, 'Lady Godiva'"
Cucurbita pepo 'Lady Godiva' is also called Hulless Seeded Pumpkin. Each 'Lady Godiva' squash yields up to 1/2 lb. of nutritious and delectable seeds that are high in zinc and need no shelling. Great in stir-fries, for baking, or just plain munching. Plants often bear 10-12 fruits each. Tasty orange flesh is a bonus. Planting depth: .5-1 inch. Days to germination: 3-7 days. 80-90 days to maturity. reviews for "Winter Squash and Pumpkins: Cucurbita pepo, 'Lady Godiva'"